I usually try to make these every Hanukkah but as our apartment is being renovated, our Menorah is packed away and our kitchen is unusable until our countertops get installed later this week, I had to miss a year. But these are delicious and easy to make, despite their funny name. 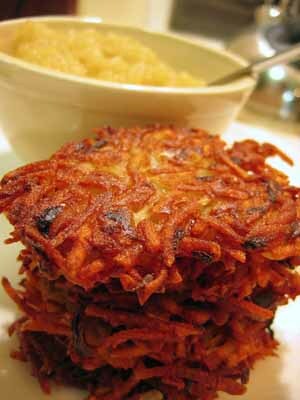 Here's a recipe -- you don't have to be Jewish to make them. They're basically just potato pancakes.